You might say the idea for West Midtown’s thoughtful Provencal-inspired AIX restaurant and companion wine bar Tin Tin has been brimming inside chef-partner Nick Leahy’s head ever since he had his first forkful of warm duck confit salad as an 8-year-old in the South of France. Best known to Atlanta diners as the former chef-partner at Saltyard, the popular South Buckhead tapas-style restaurant, Leahy’s latest culinary endeavor is focused on crafting updated versions of his family’s classic French recipes and sharing his love of French Provencal dishes with his adoptive city. 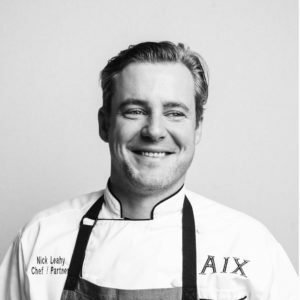 Leahy sees AIX and Tin Tin as the ultimate opportunity to combine his lifelong love affair with global fare and local ingredients, a pairing that best represents his international and Southern roots. Born in Bermuda to an Irish-American father from Queens, New York, and a half-French mother from England, Leahy was exposed to many cultures from an early age. After leaving Bermuda, he lived briefly in London before settling in Atlanta with his family at the age of 8. As a young adult, Leahy learned his craft while cooking at some of Atlanta’s finest culinary brands, including Concentrics Restaurants (One Midtown Kitchen, Two Urban Licks and Parish) and Fifth Group Restaurants (South City Kitchen, Ecco) under the tutelage of executive chef Chip Ulbrich. After marrying Danielle, his wife and now-business partner, the young couple decided to seek out new adventures elsewhere. In 2011, they left for an exciting six-month culinary tour of Europe and Kenya before settling in London. Leahy spent the next year as executive chef at London’s Daylesford Organic, a true farm-to-table concept where the farm and the restaurant are owned and operated as one. It was here that Leahy’s enduring love of local, organic and seasonal food was strengthened. Upon returning to Atlanta, Leahy teamed up with restaurateurs Kristy and Christian Favalli to open Saltyard, winning over loyal diners with its emphasis on seasonal and local ingredients. The menu reflected many dishes inspired by Leahy’s 2011 travels, such as making his own burrata from Italy (a fresh mozzarella, stracciatella and cream hybrid) and Spanish-style boquerones (marinated anchovies). Leahy’s passion for food extends beyond the kitchen as well. In September 2014, he was the first chef ever to be elected to the Board of Trustees for Meals on Wheels Atlanta (MOWA), a charitable organization providing daily meals to senior citizens in need. Since becoming involved, he has facilitated a partnership between the Peachtree Road Farmer’s Market and MOWA, which enables MOWA to purchase organic produce directly from the farmers at a discount, while allowing the farmers to liquidate their leftover goods. Most importantly, the partnership provides the MOWA seniors all the benefits of eating locally grown produce. Additionally, Leahy is associated with prominent food organizations such as Georgia Grown, The Slow Food Movement, the James Beard Foundation, and Georgia Organics. In 2017, he fulfilled a lifelong dream of cooking at the James Beard House in New York City. When not in the restaurant, you will find Leahy reading, hiking or spending time with his wife, two daughters and their corgi.